Anne Fadiman is the author of two essay collections, At Large and At Small and Ex Libris, and the editor of Rereadings: Seventeen Writers Revisit Books They Love. 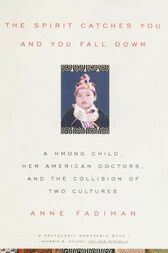 The Spirit Catches You and You Fall Down received a National Book Critics Circle Award, an L.A. Times Book Prize, and a Salon Book Award. Her essays and articles have appeared in Harper's, The New Yorker, and The New York Times, among other publications. She is the Francis Writer-in-Residence at Yale.